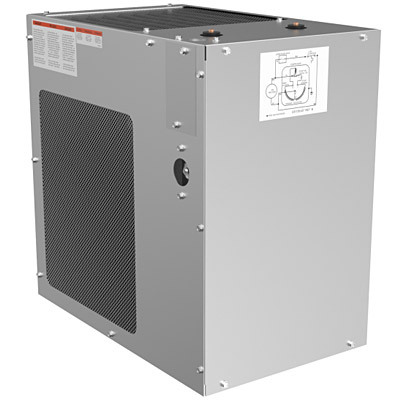 The Oasis R12 Remote Water Chiller shall deliver at least 12.0 gph of water at 50°F cooled from 80°F inlet water at 90°F ambient. Evaporator shall be high efficiency tank type and shall be encapsulated in insulation. R-134a refrigerant system shall be hermetically sealed and refrigerant flow shall be capillary tube controlled. An adjustable thermostat having an off position shall control refrigeration system. Cabinet shall be galvanized steel. Potable water system components shall comply with Safe Drinking Water Act Amendments, the 1988 Lead Contamination Control Act and shall be Certified to ANSI/NSF 61 Section 9.